The last part in the Book-series of the Mail-Interview Project has now been published. It contains only a few more interviews, but they are also quite interesting. Also the complete lists and details about the project are added with reprints of the hardcopy covers that were made over the years. 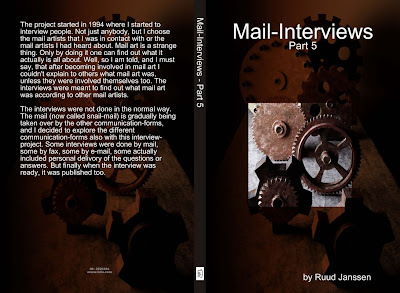 A selection of 5 more Mail-Interviews conducted by Ruud Janssen with International Mail-Artists and Fluxus-Artists in the years 1994 till 2002. This time also unfinished interviews and an overview of all names of the interviewed persons! Includes interviews with John M. Bennett, The Unexpected, Jürgen O. Olbrich, Ko de Jonge, Michael B. Corbett and a reprint of the mail-interview Newsletter that explains the Mail-Interview Project. A part of the book is reserved for reprints of the covers made for the booklets in the 90-ies.